Cyanosis can be divided into central cyanosis and peripheral cyanosis. Central cyanosis is caused by abnormal composition of hemoglobin such as sulphaemoglobinaemia and methaemoglobinaemia or decreased in the saturation of the oxygen because of cyanotic congenital heart disease, pulmonary embolism,pulmonary edema ( required urgent treatment ) and severe respiratory disease. Peripheral cyanosis is caused by acrocyanosis, venous occlusion, arterial occlusion ( recognized and treat urgently), Raynaud’s phenomenon, cold exposure as well as all the causes of central cyanosis. What is cyanosis? Cyanosis is a blue discoloration of the mucous membrane and skin due to the present of 5g/dl or more of reduced hemoglobin in the circulation. It is different from hypoxemia /anemia that occur without cyanosis. Peripheral cyanosis most commonly affecting the lower and upper limbs. Raynaud’s phenomenon is a condition of episodic three color changes of the hand that is associated with arterial vasospasm ( white in color ), cyanosis ( blue in color) and reactive hyperemia ( red). Raynaud’s phenomenon is an idiopathic disorders or related to drugs ( beta blockers ) or connective tissue disorders. The hand which is persistently cold and blue is associated with acrocyanosis. 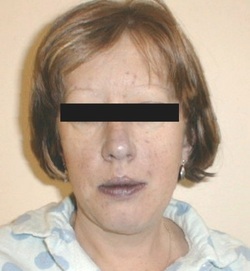 Pain, peripheral cyanosis and mottling of the skin are associated with acute arterial occlusion. Phlegmasia cerulea dolens or painful blue leg is caused by iliofemoral deep vein thrombosis. Central cyanosis may be accompanied by shortness of breath / dyspnea which is sudden onset in nature in case of pulmonary edema and pulmonary emboli. Gradual onset of shortness of breath /dyspnea and central cyanosis is commonly associated with asthma. Pulmonary emboli or pneumonia may also present with pleuritic chest pain and central cyanosis. Aching, dull , tightness of the chest are common symptoms due to pulmonary edema which is one of the complication of myocardial infarction. Central cyanosis may occur since birth or first years of life in cases of congenital heart disease due to the present of anatomical right to left shunting . Asthma and pneumonia are associated with acute onset of central cyanosis . COPD patient takes many years for cyanosis to develop. Polycythemia in COPD patient may worsen the cyanosis. Cardiac failure and pulmonary emboli may present with immediate onset of central cyanosis. Certain types of drugs such as sulphonamides and phenacetin may lead to sulphaemoglobinaemia and methaemoglobinaemia which leads to central cyanosis. The present of any lung disease with significant severity is associated with central cyanosis. Central cyanosis is a bluish discoloration of the digits and mucous membrane while peripheral cyanosis is a bluish discoloration of the digits. Pyrexial patient usually suffer from pulmonary emboli and pneumonia. On inspection, cyanotic patient and barrelled chest which is poorly expanded is associated with COPD/ chronic bronchitis patients. Congenital cyanotic heart disease is associated with clubbing. 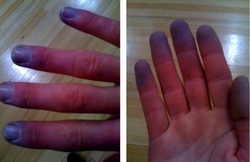 Episodes of peripheral cyanosis and small areas of infarction on the fingertips are associated with Raynaud’s phenomenon . Congestive cardiac failure ‘s patient may present with raised jugular venous pressure. Lobar pneumonia may present with impairment of unilateral expansion of the chest dullness to percussion and localized crepitation as well as bronchial breathing over and area of consolidation. Widespread crepitation mostly associated with chronic bronchitis, pulmonary edema and bronchopneumonia. Poor chest expansion and air entry are associated with asthma and chronic bronchitis. Wheezing is associated with asthma. The investigations require are full blood counts, arterial blood gases, oxygen saturation, chest x ray, ECG, blood and sputum cultures, V/Q scan, CTPA, duplex doppler or venography, digital subtraction angiography , Hb spectroscopy and echocardiography. Full blood count may reveal rise in Hb level in chronic cyanosis. Rise in white cell count in case of pulmonary embolism and pneumonia. Arterial blood gases in severe lung disease may reveal a decrease in partial pressure of the oxygen. oxygen saturation is below 85% in cyanotic patient. Chest x ray is useful to rule out cardiac failure, pulmonary infarction and pneumonia. ECG may reveal the features of myocardial infarction and pulmonary emboli. Blood and sputum cultures are useful to rule out pneumonia. Pulmonary embolus is detected by CTPA or V/Q scan. Duplex doppler or venography is useful for identification of acute venous occlusion. Acute arterial occlusion is best observed with digital subtraction angiography. Hb spectroscopy is used to detect sulphaemoglobinaemia and methaemoglobinaemia. Cardiac failure is detected with echocardiography.